Nick Clegg has been invited to Benefits Street by one of the stars of the controversial Channel 4 reality show. Deidre Kelly - known as White Dee - spoke to the deputy prime minister on his weekly LBC radio phone-in show. She told him she had switched from voting Lib Dem to Labour because she was angry at his coalition with the Tories - but could be persuaded back. Mr Clegg said he had not seen the show but was concerned about the "demonisation" of people on benefits. Benefits Street, which follows the lives of people on James Turner Street in Winson Green, Birmingham, has been held up as an example of what is wrong with Britain's benefit culture by commentators on the right. But left-wing commentators - and some residents - have accused it of demonising the poor and presenting a biased view of life on the breadline. Channel 4 says the programme is "fair and balanced". Speaking on LBC, Dee said the programme had been "cleverly edited" and she had not expected it to generate so much controversy. 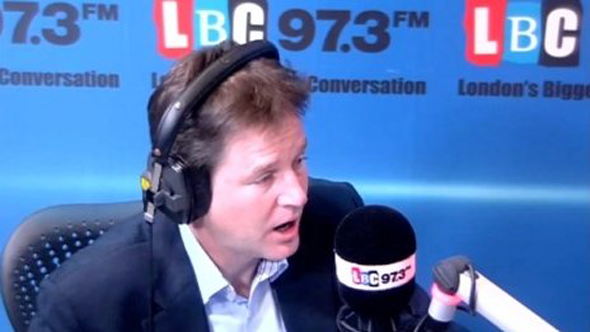 She asked Mr Clegg if he agreed with its portrayal of the unemployed. The deputy PM said he had not seen it but there needed to be a "hard-headed" debate about what benefits the country could afford. He said politicians had to avoid "demonising whole groups of people" and the welfare system had to be "compassionate". But he added: "Receiving help from the generosity of others shouldn't be a permanent way of life." Inviting the Lib Dem leader to see the street to see for himself, Dee said: "He would see a very clean street, he would see people getting together, helping each other, not scrounging, not lying around." She added: "I'm very into politics. I vote every year. I discuss with people how they should vote because I do say if you don't vote why are you moaning. "I did actually vote Labour because I was really annoyed when you went into a coalition with the Tories but, hey ho, you can win me back Mr Clegg." A laughing Mr Clegg said he could not promise on air to visit the Birmingham street where the programme was filmed but he would welcome her support at the ballot box.